"What you need is a fundamental humility – the belief that you can learn from anyone." 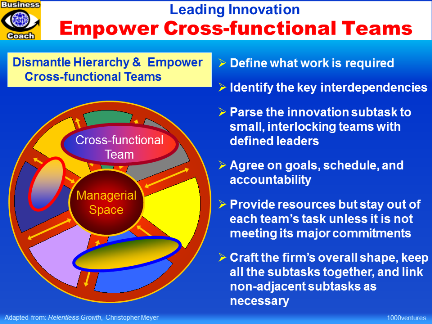 Cross-functional team is a group of employees from various functional areas of the organization – research, engineering, marketing, finance. human resources, and operations, for example – who are all focused on a specific objective and are responsible to work as a team to improve coordination and innovation across divisions and resolve mutual problems. To face today's complex challenges, you need to incorporate a wide range of styles, skills, and perspectives. 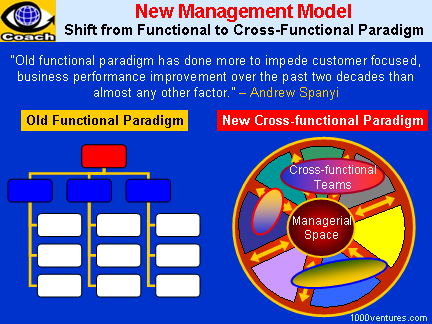 Cross-functional teams are regarded as a means to manage social collaboration and concept creation. Synergy is the energy or force created by the working together of various parts or processes. Synergy in business is the benefit derived from combining two or more elements (or businesses) so that the performance of the combination is higher than that of the sum of the individual elements (or businesses).